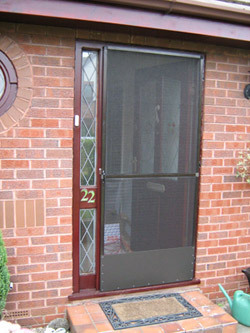 For domestic properties we can provide many types of screening systems. 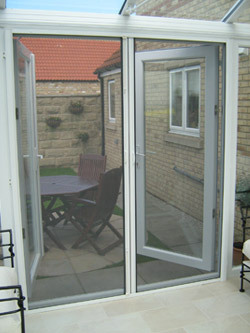 For single and double door conservatories the cassette mounted insect screens are both discreet and efficient and are used only when the door / window is open, thereby prolonging the life of the screen and minimizing maintenance procedures. The available colours are white, bronze and brown. The cassettes are spring loaded and the mesh is PVC coated fiberglass. The mesh screens fasten in position by using magnetic strips and for added safety / security, shooter bolts can be provided to lock the screens in place. For windows we supply retractable screens housed within their own cassette, these screens are usually face fitted onto the window frame. Where it is not possible to use a cassette system we can supply a choice of hinged screens using either K1 or Omega profile, both of these are permanent systems. The K1 system is used on casement windows where the handle does not encroach into the room whilst the Omega profile is used on PVC systems where the handle does encroach into the room. For Tilt & Turn windows we can also use the Omega system. Any of these systems are ideal to keep cats indoors – open the doors and windows, pull the screens across and hey presto! 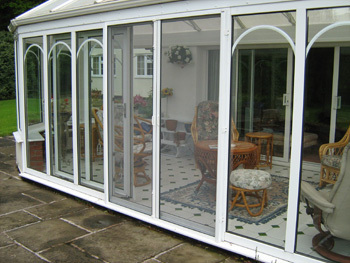 cats will stay inside the house behind the screen whilst fresh air circulates and unwanted pests are kept outside.